Due to personal issues I haven't looked very much at my stamp collection for several months now. But I have still been purchasing bits and pieces, which has led to a growing stockpile of unsorted material. A few days ago I decided to tackle the task of reorganising my Albert Decaris collection to incorporate all the new acquisitions. 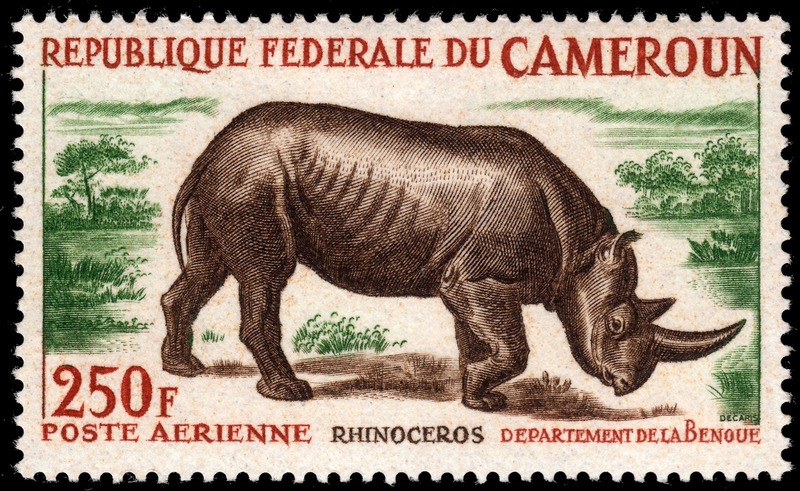 While poring over some of my lovely new Decaris stamps I came across a stunning airmail stamp he designed and engraved for Cameroun in 1964, depicting a black rhinoceros. 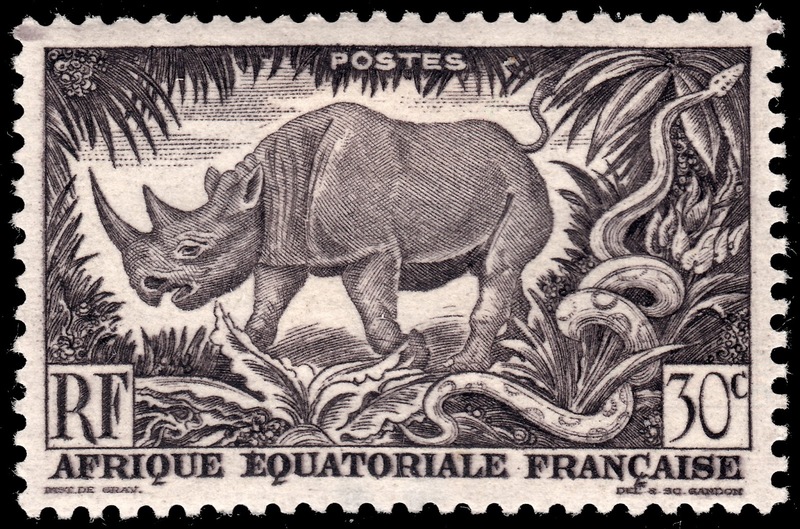 This got me to thinking about the black rhinoceros Pierre Gandon engraved for the 1946 definitive series of French Equatorial Africa. Two of my favourite engravers working on the same subject. What a fantastic opportunity to make a stylistic comparison. "Populations of black rhino declined dramatically in the 20th century at the hands of European hunters and settlers. Between 1960 and 1995, black rhino numbers dropped by a sobering 98%, to less than 2,500. Since then, the species has made a tremendous comeback from the brink of extinction. Thanks to persistent conservation efforts across Africa, black rhino numbers have doubled from their historic low 20 years ago to between 5,042 and 5,455 today. However, the black rhino is still considered critically endangered..."
Okay, before we get down to studying the two aforementioned rhino stamps, let me pose a few questions. Are you an admirer of the use of multiple colours on engraved stamps? Or do you rock it old school and adhere to a strictly monochrome palette? Or do you, like me, admire the virtues of both methods? I ask these questions because your answer may very well influence your preference regarding the two stamps you are about to see. First up, let's take a look at Pierre Gandon's black rhino, issued by French Equatorial Africa in 1946 as part of a definitive series. It must be noted that this engraving was issued in three values, each with its own colour. For the purposes of this blog I have chosen to illustrate the 30c violet black stamp. I think this particular colour really enhances Gandon's artwork. In this design, Gandon has chosen to frame his majestic black rhino in the flora and fauna of its native habitat. A particularly nice touch is the python slithering its way up the right side of the frame. Now we come to Albert Decaris' black rhino, issued by Cameroun 15 December 1964. This stamp was printed in three colours (really only two colours considering the third colour was used solely for the ttitles), which some engraving enthusiasts may frown upon. But I believe in this instance the extra colour serves to enhance rather than hinder this lovely work of art. In this design Decaris has beautifully illustrated the lumbering majesty of the black rhino, printed in dark brown. The background, printed in green, depict trees and grassy plains, providing us a glimpse into the world in which this giant chooses to live. So now that you've studied both stamps, which is your favourite? Do you prefer the classic monochrome artwork of Gandon? Or does the multi-coloured creation of Albert Decaris appeal to you more? I've personally given this a lot of thought and sat staring at each stamp alone, then together, for a long while. And to be totally honest, I can't decide. I happen to like both interpretations equally. Both artists were immensely talented, and both artists brought something unique for us to admire into their pieces of art. I have to say I really enjoyed spending time with each artist and his work. Je préfères celui de Gandon !!! Both of them are awesome and each rendering has merits of its own. Thank you for your observations while posting them side by side.